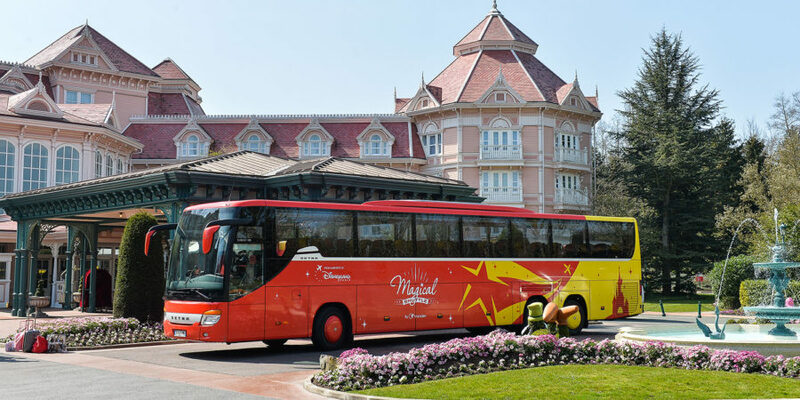 Magical Shuttle offers daily direct connections between Roissy-Charles-de-Gaulle airport and Disneyland® Paris. If your arrival schedules are not compatible to take the T1 shuttle, follow the directions to Terminal 2E / 2F: take CDGVAL, then follow the signs to Terminal 2F arrivals level, then take the corridor door 8. 2A: Follow signs for Terminal 2C, then Terminal 2E, Arrivals, and once at door 8 take the corridor. 2B/2D: Follow signs for Terminal 2F, Arrivals and once at door 8 take the corridor. 2C: Follow signs for Terminal 2E, Arrivals; once at door 8 take the corridor. 2G: Take the bus to Terminal 2F, go down to the Arrivals level and once at door 8 take the corridor. Terminals 2A/B/C/D: Take the bus to Terminal 2E, head towards Arrivals and once at door 8 take the corridor. Follow signs for Terminal 2 then CDGVAL and then Terminal 2F Arrivals, once at door 8 take the corridor. CAUTION: For your return journey, we recommend that you schedule your shuttle departure at least two and a half hour before checking in at Roissy CDG airport.